Hey everyone! This podcast is loaded with great information and a personal testimony by Frank about supporting healthy cholesterol levels. DISCLAIMER: This podcast episode does not contain anything more than information about health. The recommendations are informational – discuss any new health plans with your healthcare provider before starting anything. What you think you know about cholesterol may be incorrect. It is essential for life. But, are you consuming and creating the healthy versions necessary to optimize your health? Well, join Frank and Jackie as they discuss this very topic! What exactly is cholesterol and how is it made? Over on my Facebook page, I am always talking about Kombucha. I am a Kombucha addict. I love it. I love the taste, the smell, and the squishy SCOBY’s that I use to make the drink. It is my drink of choice. I get so many messages and comments from people who have never heard of it. Well, here is my little bit of knowledge on the health benefits of Kombucha. Kombucha is an ancient elixir that has a history of starting in China and, somehow, made it’s way over here to America. It is a sort of “tea” that is infused by fermentation with beneficial bacteria, probiotics, and yeast and is great for your gut and overall health. It is made from either using black or green tea, and some herbal teas, some sugar (which the yeast feeds on), and lots of patience. The SCOBY (“symbiotic colony of bacteria and yeast”) looks like a flat mushroom but solid and squishy. This SCOBY is actually alive and feeds on the white sugar that is in the tea. Wait, WHITE SUGAR?!?! Yes, plain old white sugar. It may be the only thing I buy white sugar for, but my SCOBY’s thrive on it. After fermentation, which usually takes around 7-10 days, the SCOBY is then taken out of the tea and the tea is then bottled and refrigerated and ready to drink! Or, you may choose to do a second fermentation which is just for a few more days. The purpose of the second fermentation is to create more “fizz” (Kombucha is naturally carbonated because of the fermentation) and, also, a time to add any kind of fruit flavorings that you may want to the tea. My flavoring of choice is Pom juice. I add a few ounces to every 16 ounce jar and it gives it a delicious taste. Taste. What does it taste like? I get this question all the time and it’s really hard to describe the taste. To me it taste like something between a hard cider and champagne. But, no, Kombucha is not alcoholic. Why do I drink it? Well, first of all, I’m cheap. I am a self-proclaimed cheapo and the cost of probiotics is just ridiculous. The cost to make a gallon of Kombucha is around $1! The cost to buy a 16 ounce bottle of Kombucha from a health food store is $4!!! The cost to buy a bottle of probiotics is $40! Hmmm, tough decision but I’ll stick with my cheap Kombucha! Step One: Boil 2 quarts of water and add 3 family-size tea bags and 1 cup of white sugar. You can use organic sugar and organic tea if you would like, but it is not necessary. Step Two: Once the tea is cooled (not hot, you could kill your SCOBY) add it to a gallon glass jar. Must be glass. Then add 2 more quarts of filtered water and 1 cup of starter liquid (which should have come with your new SCOBY). Step Three: Cover the jar with a coffee filter or cloth and set aside to ferment for 7-10 days. 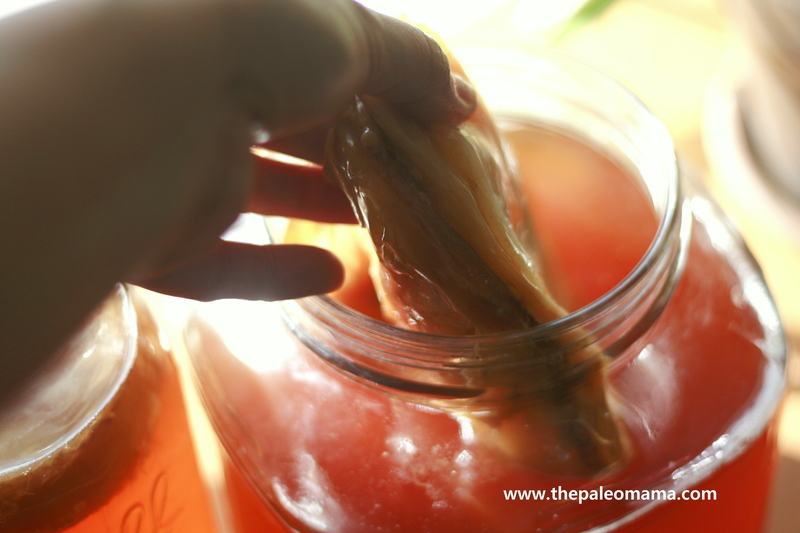 Taste it every other day or so and you will learn about the process of how the SCOBY alters the taste. Step Four: Take the SCOBY and the new baby that may have formed on the top of the liquid and put them aside. Step Five: This is personal preference now, as I mentioned above. Either bottle it up and put the Kombucha in the fridge or do a second fermentation. I don’t do a second fermentation. I just bottle it up, add a few ounces of Pom juice to the bottles and put them in the fridge. Make sure you keep 1 cup of the Kombucha to put in the next batch. This is your starter liquid which will get the next batch going. Step Six: Repeat steps 1-5 and drink up! You can either buy Kombucha at health food stores, or you can easily make it yourself at home! 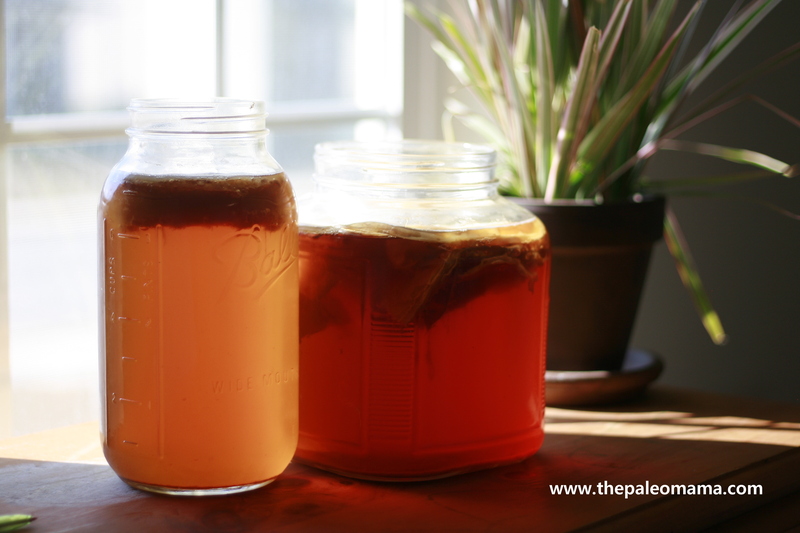 Click here to get Kombucha cultures to make at home.